New York Liberty regained much needed confidence after changing their starting line-up and crushing Washington Mystics by 30 points, 88-55. Liberty hosted Mystics at Madison Square Garden for game two of their three-game homestand. The Mystics were short-handed two key players, three-time All-Star Elena Delle Donne and Tayler Hill, due to a sprained right ankle and a torn right ACL respectively during their last matchup against Indiana Fever. Despite the absence of Mystics’ key players it did not derail Liberty’s game plan of pushing the game offensively. 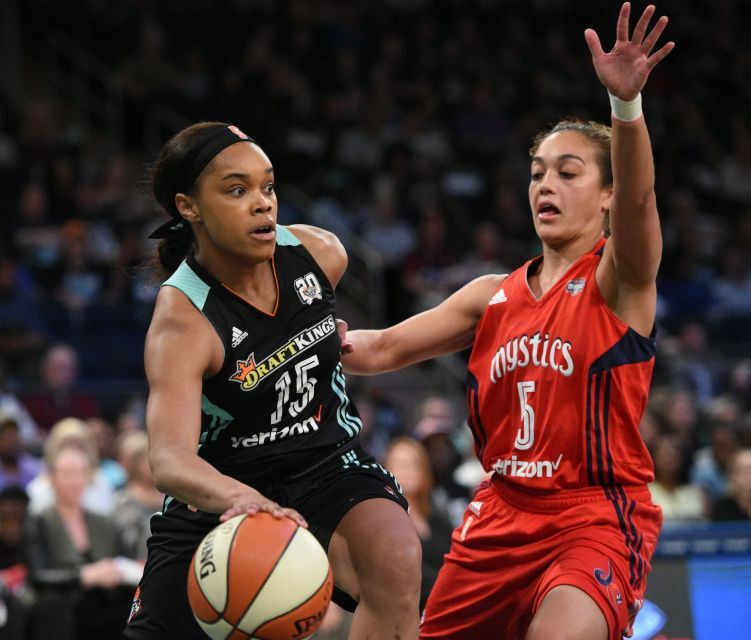 Recently, Liberty has been struggling offensively, especially during their last matchup when the benched scored a combined total of nine points in a loss against Chicago Sky. Liberty has won one out of their last six games. Liberty head coach, Bill Laimbeer, started Bria Hartley instead of Sugar Rodgers, tweaking the final starting line-up to Epiphanny Prince, Shavonte Zellous, Tina Charles and Kia Vaughn. Hartley led fast breaks, scored at the right moments and enhanced the tempo of the game which was infectious. From the start of the game, Liberty commanded the first quarter with a 30-14 lead. Overall, there was a consistent flow of movement offensively on and off the ball resulting in the entire team scoring. The bench scored a combined total of 41 points. Hartley scored a team high of 15 points and finished with four rebounds, one assist and one steal. Laimbeer liked the idea of having Sugar Rodgers on the bench to help keep a solid scorer in constant rotation. Also, she allowed more opportunities for others. Another important takeaway from this game was to see every player contribute offensively with points when Liberty’s top scorer and the league’s third lead scorer (20.1 ppg), Tina Charles, scored just six points. Liberty, known for their high-ranking defense, contained Mystics to 27.3% from the field goal and 22.2% from the three-point range. Mystic’s Emma Meesseman who replaced Delle Donne as a starter scored a game high of 19 points. “We’ll see what happens at the next game. But I think I like the direction we’re going in and I think the players like the direction were’ going in. And let’s see if it continues,” said Laimbeer. Liberty (9-9) is back at .500. They have one more game on Wednesday, July 19 at 11:00 a.m. ET before the All-Star break against the eastern conference leaders Connecticut Sky (12-9).